Are you caught in the middle between supporting children and caring for aging parents? At a time when your career is reaching a peak and you are looking ahead to your own retirement, you may find yourself having to help your children with college expenses or supporting them during a job search while also looking after the needs of your aging parents. Squeezed in the middle, you've joined the ranks of the "sandwich generation." If you feel trapped in the middle, you've got company: according to Wikipedia about one-in-four (25%) middle-aged adults is providing financial support to both an aging parent and a child. Today members of both the Baby Boomer generation and Generation X are part of the “sandwich generation.” Since Pew first explored this topic in 2005, many Baby Boomers have since “aged out” of the sandwich generation. Today, Generation X’ers are more likely than Baby Boomers to find themselves in the “sandwich,” and the number of Millennials included is on the rise. Gather or locate important documents from them, such as Social Security number(s), Medicare or Medicaid numbers, insurance information (especially long-term care & life insurance), doctors and their phone numbers, medications, bill pay notifications, property deeds, trusts, driver's license number, birth certificate and any other relevant information. Check for updated wills, trusts, and beneficiary designations on retirement plans and insurance policies. It's essential that your mother and/or father have a current durable power of attorney — for both financial care and health care — and a living will. The durable power of attorney (POA) and HIPPA waiver allows your parents to give you (or another trusted person—it doesn't have to be a lawyer) the right to make financial, legal and health decisions on their behalf. Review your own financial situation. Assess all of your assets, liquid and otherwise. Figure out how much you plan to contribute to your children's college and your retirement. If possible, you may want to create a financial plan with a reputable financial planner. See Your Financial Health Checkup on our website for a list of items to review with them. 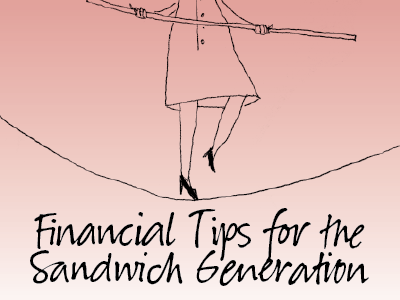 According to a financial support survey done by TD Ameritrade, one possibility as to why there continues to be an increase in the number of adults in the sandwich generation is the indication of the looming retirement crisis starting to manifest itself. This survey revealed that people are not properly planning for retirement, especially as lifespans are expanding. Avoid dipping into your retirement savings to pay for college. You can finance college, you can’t finance your retirement. If you have grown children returning home, make sure all your expectations have been shared with them. Don't be afraid to discuss employment and income goals as well as a target date for their departure. If you’re part of the sandwich generation, you’ve got your hands full. Your natural inclination might be to take care of yourself last, but that can jeopardize not only your financial health but also your physical and mental well-being. Get enough rest and relaxation regularly, and stay involved with your friends and interests. Finally, keep lines of communication open with your spouse, parents, children and siblings. Heidi Clute, CFP® of Clute Wealth Management, a Registered Investment Advisor, in Plattsburgh, NY, and South Burlington, VT, an independent firm that provides strategic financial and investment planning for individuals and small businesses in the Champlain Valley region of New York and Vermont. Clute Wealth Management and LPL are separate entities. Securities offered through LPL Financial. Member FINRA/SIPC. The opinions voiced in this material are for general information only and not intended to provide specific advice or recommendations.